We have tried to offer a flavour of the barn itself and the beautiful countryside which surrounds it. If you have any questions regarding the accommodation, please don’t hesitate to call. Please note, though we love animals here at Crabtree, we do not allow guests to bring pets. If you would like to reserve dates, please take a moment to fill in the form and calendar on the right. We know you will love the cottage and the surrounding area as much as previous guests have (see our Guestbook). To make a reservation, simply follow these 5 easy steps. Fill in the form, making sure you include your email address and telephone number (inc international dialling code if necessary). Upon clicking the ‘Send’ button, your chosen dates will turn Yellow. You will receive an acknowledgement email from us. We will contact you to confirm the booking and take payment. 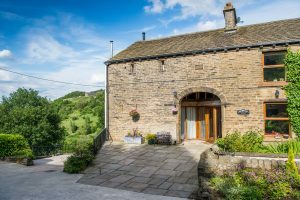 Spend a week in our beautifully restored barn overlooking the West Yorkshire countryside. Stunning views and an idyllic setting, this holiday accommodation is perfect for walkers and those wishing to explore the North of England. Just 10 minutes drive away is the small town of Slaithwaite (pronounced Sla’wit) with artisan bakery and plenty of cafes and pubs. We are also just 2 miles from the Marsden Moor National Trust park. A £200 breakages bond is required which will be returned after your stay. Use of a car is essential for staying with us, due to our remote location. Eastbound on the M62, we are 6 minutes away from junction 23. Westbound on the M62 exit at junction 24 and take the A640 towards Rochdale (approximately 12 minutes). We send out detailed directions to guests a week before arrival.